Our family is really into creating memories. This is how I learned to quit avoiding being in the picture. She took my breath away. Measuring 102 x 84 she is huge! She took up the whole wall in the National Gallery of Art in Washington, D.C. all by herself. I love art that makes me feel something. Fanny Fingerpainting by Chuck Close gave me the impression that this woman was important to the artist. I felt certain she was loved. From her wrinkles, to her age spots, and every strand of gray hair. I was puzzled by the medium, because it looked so much like a photograph. It isn’t. 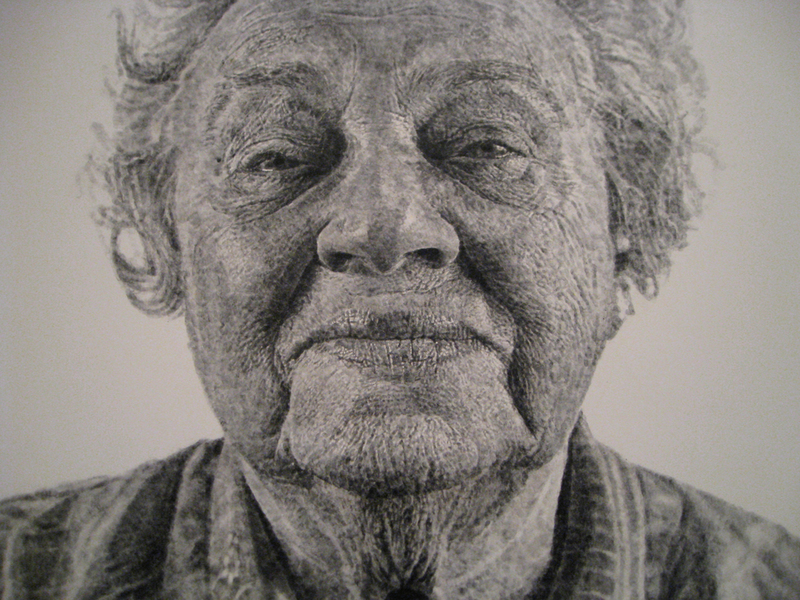 Chuck Close painstakingly recreated a photo of his wife’s grandmother, Fanny Lieber. She was a holocaust survivor, one of the few of her family to survive. What moved me to tears was when I stepped closer. It is literally a fingerpainting. By applying pigment to his fingertips and applying more or less pressure as he pressed his fingers to the canvas Chuck Close captured every beautiful bit of her aged face. Was this her best hair day? No make up, no touch up, the painting is pretty raw. I love it. And it changed the way I feel about photography, even though it isn’t a photograph. In part because in 2010 my sister-in-law passed away. After the funeral I got a phone call from my brother-in-law asking a favor. His wife was amazing about taking and displaying family photographs. But when they went through them after her passing, she wasn’t in them. She was always behind the camera. And they were hoping I had some of her with the family. I found very few. So as I sat and stared at Fanny Lieber’s face so lovingly recreated on canvas I thought about all the times I wouldn’t let my picture be taken because my hair was in a messy bun and I wasn’t wearing makeup. Or I would rather wait until I got my weight down where I wanted it before being photographed. Or I didn’t like my outfit. Or I was self conscious about a variety of things regarding my appearance. And it got me thinking, what is it that we love about the people we love? What did I love about my grandparents? I didn’t see wrinkles and gray hair. I saw smile lines. I saw love in their eyes. They looked great to me. I wish I had more photos of them now. 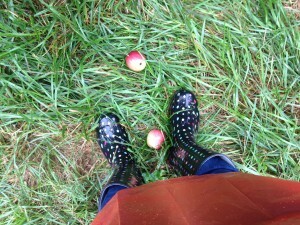 Recently we went apple picking as a family. 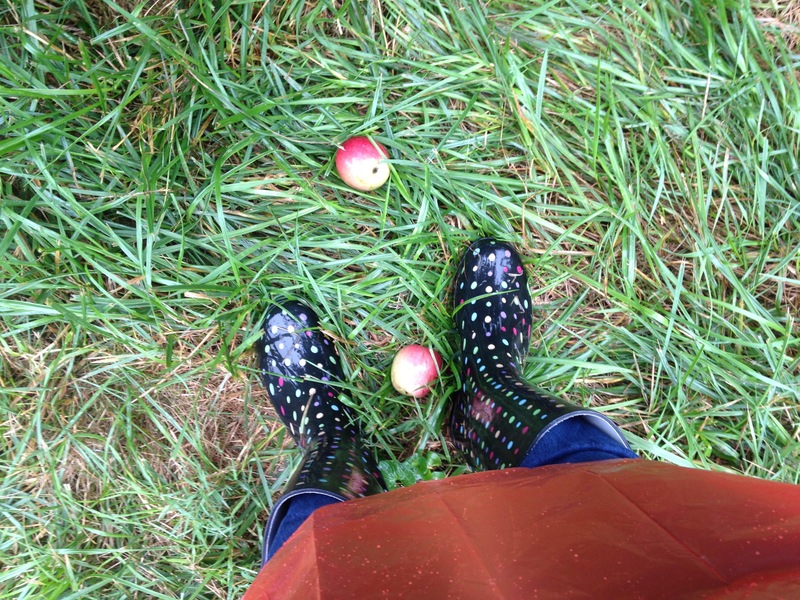 It was the only day we were going to be able to honor our yearly apple picking tradition because of all our competing schedules. And it was raining. With no sign of stopping. I threw my hair in a ponytail, slapped on some foundation and rushed to put on mascara before we headed out. I shouldn’t have bothered. 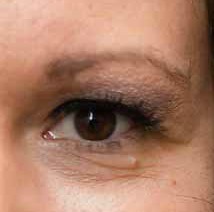 Speaking of ridiculous self-conscious nitpicking at photos I am going to tell you that I generally like my right eye better than my left. That little mole under my left eye is weird. I never color it black, but invariably halfway through the day my makeup gets on it and it turns black and looks like I am trying to fake my way into a beauty mark. Also, my left eye waters. Not for no reason. It waters for lots of reasons. It waters if it is too warm, too cold, the wind blows, or there is not enough wind, because I wipe it and there is lotion on my finger, there is dust in the air, and sometimes because I poke myself in the eye with mascara. It waters because I wore makeup and because I didn’t. Eyedrops don’t help, and I almost always have a tissue for it, and my optometrist has no clue why that eye is such a bother. 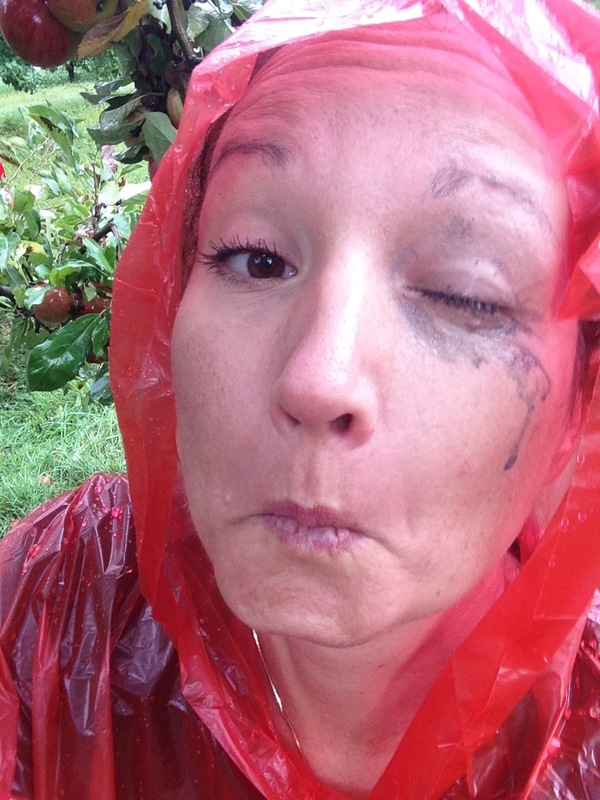 While apple picking, my eye watered because a drop of rain dripped in my eye. So I preferred taking pictures of myself like this. But I didn’t want the day to be remembered as if I wasn’t there. So I took this. Here is small list of pictures I wish I had of me with my grandmas. I wish I had a picture of the day she taught me how to make paper dolls, and when we made homemade Valentine’s together, and worked in her garden, and picked tangelos from the trees in her backyard, and when she taught me new ways of doing my Barbie’s hair, and eating Granny bread, which is dry, crumbly, healthy, awful tasting homemade wheat bread fried in butter. Wow did butter make a difference! I wish I had pictures of the button jar, her teaching me to crochet, me failing at knitting and rolling the yarn for her instead, her taking me to the fair where I rode my first roller coaster all by myself, and won Goldie the goldfish who lived 7 years despite finding her laying on the counter because my cat got her like a bajillion times and I never cleaned her bowl. Ever. Once we just bought a new one. The number one thing Grandmas need to know about photography is this. Get in the picture! 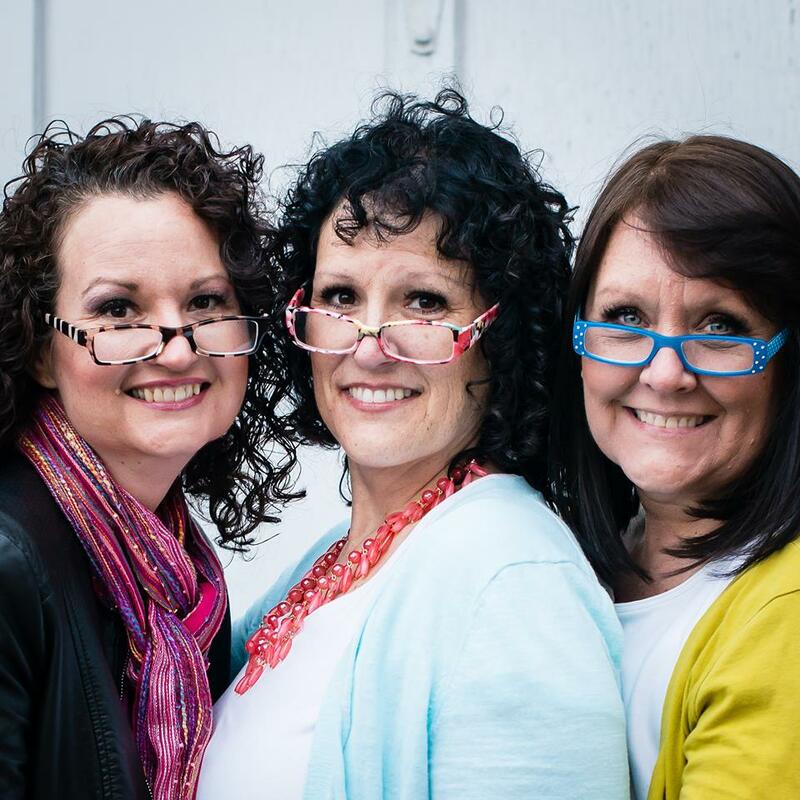 If you don’t know how to take selfies yet, ask your grandkids to show you. And get a selfie stick. 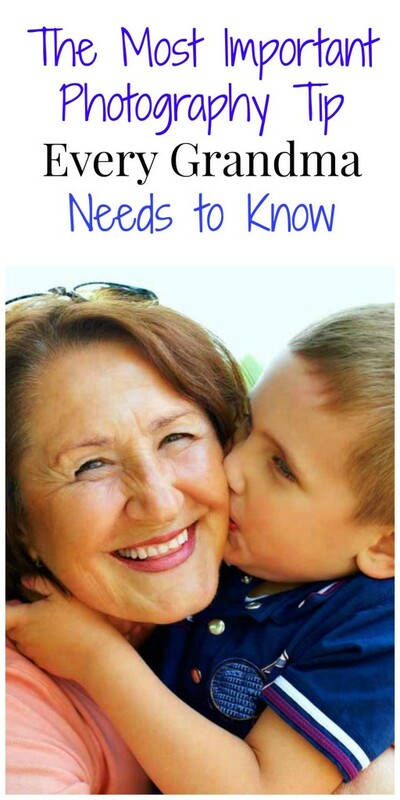 Take pictures of you with your grandkids. Let them have memories preserved of all the times you were there. So maybe one day your grandkids will laugh at your out of style clothes. Or giggle at your funky hair. Mostly what they will remember is that you were there. With them. Smiling into the camera. With them. Having a great time. With them. Eating and laughing and loving and sharing and living a great life. With them. Grandma, get in the picture!